Alpinestars has always been a driver and innovator in the market of motorcycle protective gear, and this fall will be no different when Alpinestars charges into the scene of airbag protective gear with the new Alpinestars Tech-Air Street Airbag Vest. Unlike other airbag gear, the Tech-Air is neither integrated into a single garment, nor a tethered stand-alone product. Instead, the Tech-Air is designed to be inside a compatible Alpinestars street-based motorcycle jacket. Being an add-on unit, the Tech-Air can stay with you when you change to a new jacket within the line, thus extending the effective usability timeline. This way, if a jacket is worn out (or worn down) you can remove the Tech-Air system and re-use it in the replacement. Additionally, the Tech-Air system has two separate charges, so it can be triggered twice before needing to be recharged by Alpinestars. 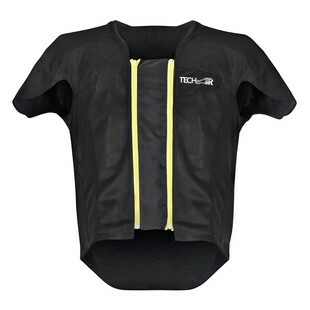 When the Tech-Air system is triggered, it provides protection for the back, the chest, and the shoulders within 25 milliseconds. The Alpinestars Tech-Air Street Vest is currently the most versatile airbag accessory on the market, usable for both track and street. It is great for anyone that wants more protection than standard armor can provide.